The RBA refuses to implement macroprudential regulations, the FIRB is unwilling to enforce foreign investment rules, APRA allows the Big Four banks to use generous, opaque and manipulated internal ratings based models to determine wafer-thin capital buffers, ASIC declines to investigate serious allegations of subprime fraud, unfettered self-managed super fund property investment is booming, and government will not consider reregulation of the banking and financial sector or reduce leverage-inducing tax expenditures. 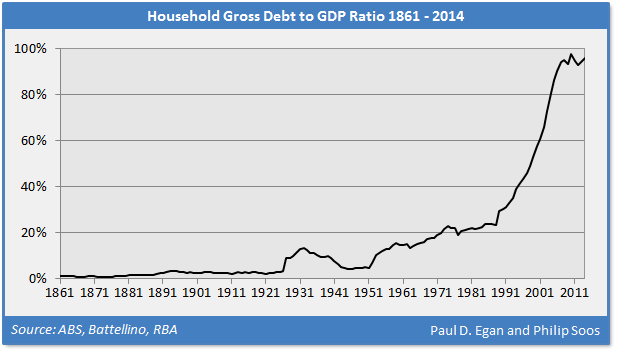 As noted in our forensic investigation of the banking and real estate markets – Bubble Economics: Australian Land Speculation 1830-2013 – the Australian economics profession has never managed to identify any growing asset bubble or predict the subsequent economic fallout. There is no evidence economists warned about or even noticed the real estate bubbles in the 1830s, 1880s, 1920s, mid-1970s and the late 1980s, or the stock market bubbles of the 1920s, 1987 and the Dot-Com. Not only does the mainstream economics profession have a 100 per cent failure rate in forecasting, but economists across the board expend significant effort into denying bubbles exist, as was the case with the Dot-Com bubble, and the numerous housing bubbles in international jurisdictions. If elite Harvard/MIT/Chicago economists not only missed the largest housing bubble in US history, but also denied there was one, what hope do Australian economists have? As history patently reveals, the answer is ‘exactly none’. Ignorance and/or denial are standard fare, and we should not expect anything different. Treasurer Hockey may wish to review his position, for the easy and lazy analytical path is actually being trodden by those economists and policymakers claiming that high housing prices are caused by a mythical shortage. Confronting the real causes would require our compromised legislature to proactively respond, instead of rigging government and market outcomes to benefit the growing power, profit and authority of the horde of private monopolists, usurers, speculators, rent seekers, free riders, financial robber barons, control frauds, inheritors and the indolent rich. Hockey’s comments should come as no surprise, for he owns a home and four investment properties, and is involved in a family real estate agency. His home in Canberra, purchased for a bargain basement price of $320,000 in 1997, is now worth an estimated $1.5 million, having increased in price by 369 per cent in nominal terms. There is an obvious incentive to oppose any analysis and/or policy that could potentially reduce the mountain of unearned wealth and income flowing from surging land prices (economic rents). The conservatively estimated $300 million in real estate owned by the federal politburo means this bias is widely shared by all in parliament. In conclusion, there is no housing shortage as is commonly claimed, though a temporary shortage did emerge during the GFC. Australia is a mirror image of other countries where high housing prices were also blamed on a shortage, always revealed, in hindsight, to be a chimera.